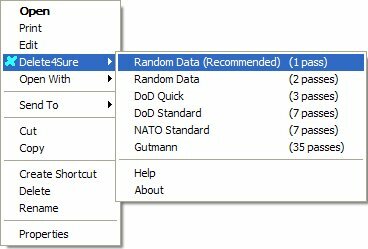 Delete4Sure adds a secure delete command to Windows. After installing, select one or more files, right-click and choose an overwrite method. Delete4Sure will overwrite the file before deleting, making it impossible for spy tools and disk utilities to recover your deleted files. The latest Delete4Sure installed and ran on Vista Home Premium without any problems yesterday. No 64-bit support yet.